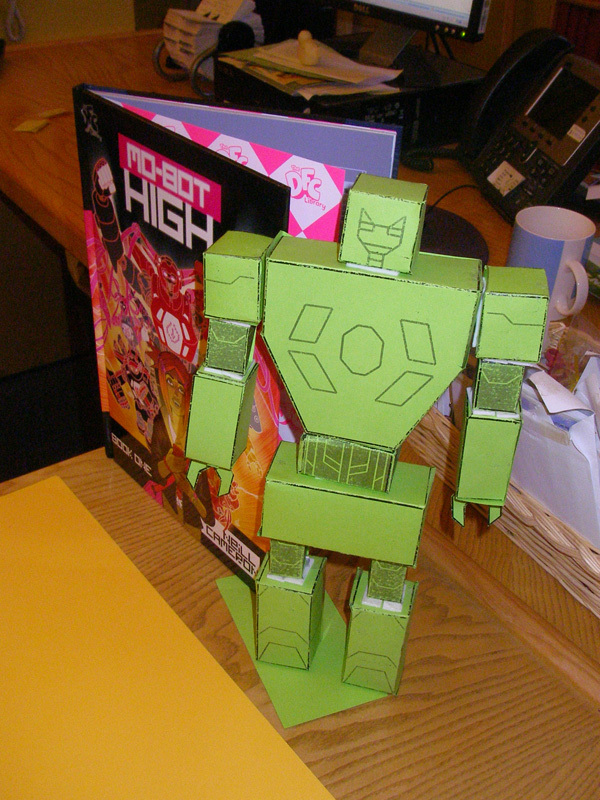 So it turns out it is quite fiddly and time-consuming to make a Cardboard Mo-bot. But - I hope you'll agree - TOTALLY WORTH IT. 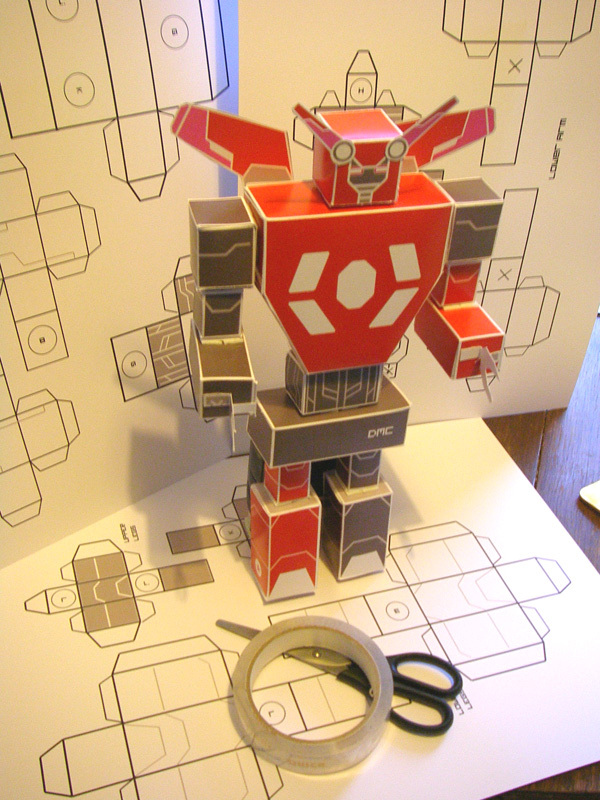 I will have a couple of kits at the Giant Mo-Bot Party on Friday, as prizes or somesuch. 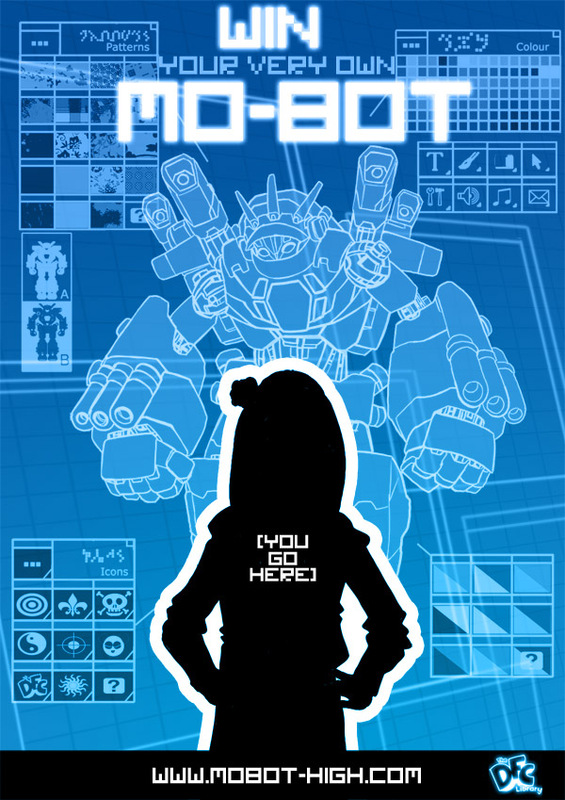 And will make them available for download from the Mo-Bot High website thereafter. A fun craft project for a Sunday afternoon! 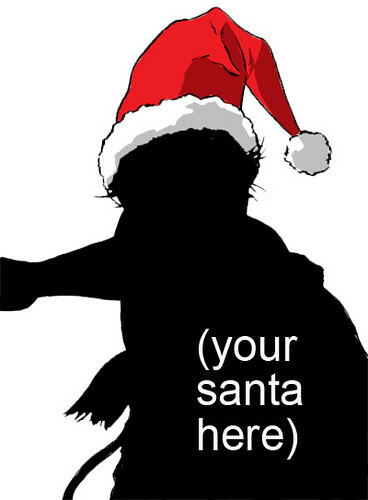 Don't forget, Santa Sketchfest 2010 starts tomorrow! If you would like a particular Santa, HOLLA AT ME. 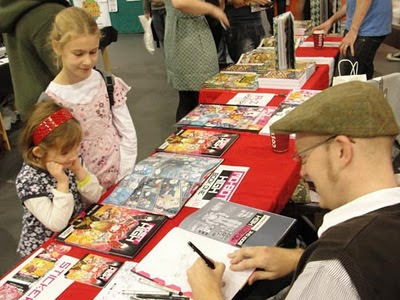 I am deeply gratified whenever someone buys my book*, and it's nice at things like comics conventions or the upcoming launch party where I get to express my gratitude in person, and do sketches and what-have-you. However, I am well aware that not everyone lives in Oxford or chooses to spend their spare time going to UK comics conventions. This knowledge pains me, so I have come up with what will hopefully be a Fun Idea to thank people remotely. And in a TOTALLY CHRISTMASSY way. For the last couple of years I have spent December drawing all kinds of Santas, and am gearing up for this year's effort. However, I thought this year I'd do something a little different. 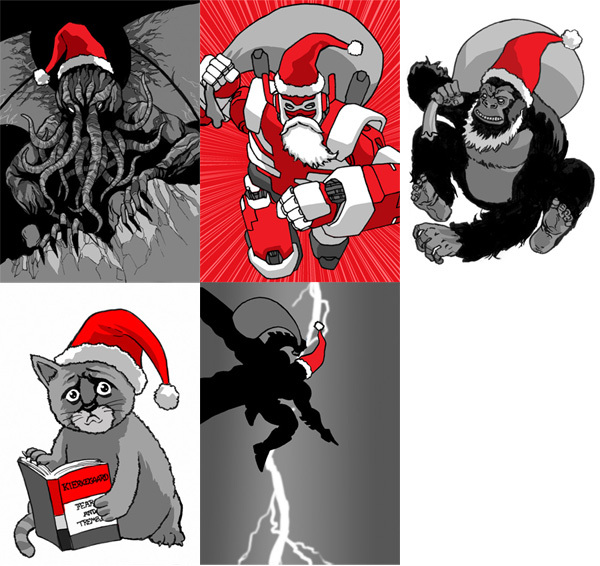 This time round, as well as accepting suggestions for Santas to draw, I will be sending the original artwork for each Santa, as a christmas card, to the person who suggested it! "Dear @neillcameron, I bought Mo-Bot High! Please draw me a Kung-Fu Santa THANKS LOVE YOU BYE"
...or similar. You can have whatever kind of Santa you like, or course. You might want to check the last couple of years' worth to check it isn't one I've drawn before. 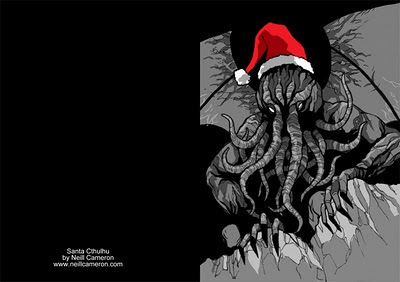 If you have no particular preference, just ask for Some Sort of Santa and I will try and come up with something suitably awesome. I'm planning to draw and post one Santa for every day of advent - i.e. 25 - but I've got 50 blank cards, so if demand should be high I'll try and get through as many as I can. Here are some of last year's Santas to get you started. 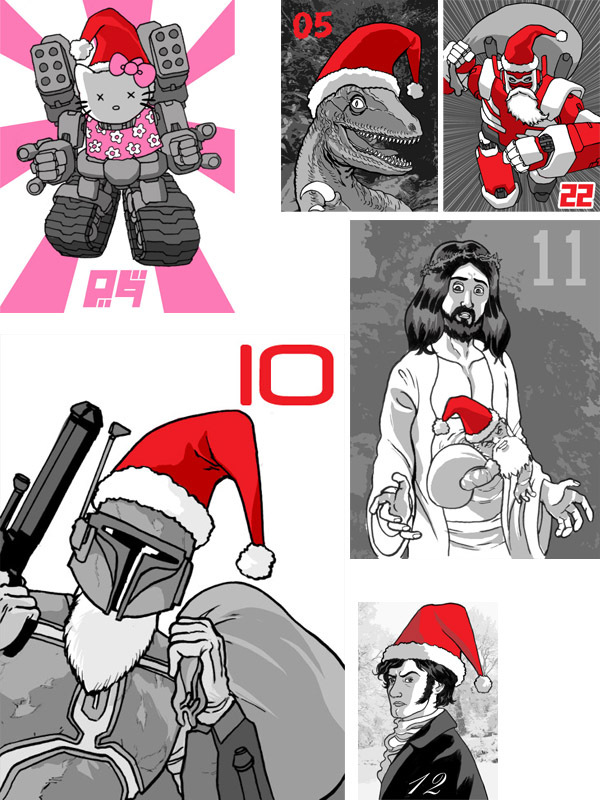 Clockwise from top left, that's: Reanimated Hello Kitty Revenge-Bot Santa, Raptor Santa, Giant Robot Santa, Weird Total Recall Mutant Quatto Jesus Santa, Mr Darcy Santa, and of course Boba Fett Santa. I guess it will have to be an honour system have no way of knowing whether people *actually* buy the book, but that's okay because fortunately I IMPLICITLY TRUST EVERYONE ON THE INTERNET. If you haven't yet bought my book, here is a web page telling you a bunch of places where you can do so. And if you have already bought it - well, thank you very much, firstly! I hope you enjoyed it. Now, why not buy another? It would make an excellent Christmas present. You know someone who likes robots, right? First Santa will appear here on Wednesday 1st December! And then one a day till Karen Gillan Day! Which is to say, Christmas. Careful with those scissors, kids. Optional GIANT LASER CANNON accessories not pictured. Many thanks to Tilda at DFB for helping make this green chap, and for supplying the tea and biscuits that made it all possible. 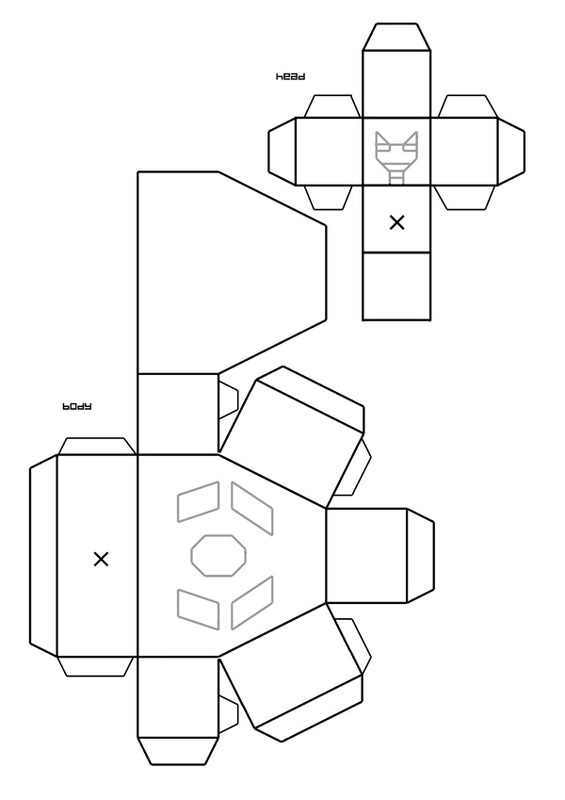 The original idea was that we would have a bunch of these for kids to make, colour in and customise on the night, but due to the rather complicated and fiddly nature of actually making them I think instead we're going to go with having a couple of nice pre-printed kits made up to give away as prizes. Not to worry! 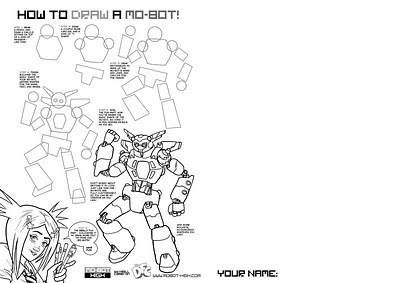 There will still be plenty of robot-customising and comics-drawing action going on on the night. It's looking like it should be a lot of fun - check out the Mo-Bot High website for details of how to get tickets and come along! 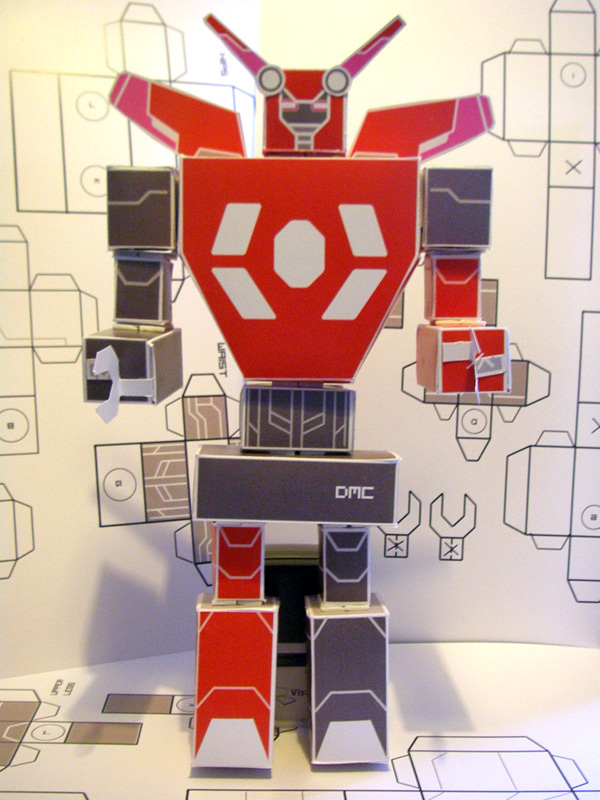 Yes, this is your chance to own your very own personalised custom Digital Mobile Combatsuit! Like everyone in Mo-Bot High has, you see? We will be holding a raffle at the Giant Mo-Bot Party on Friday December 3rd at Blackwells Bookshop in Oxford, and one lucky winner will get a full-colour glossy poster-sized portrait of THEMSELVES, with their VERY OWN MO-BOT. I will take a couple of photos and ask a series of pertinent questions to ensure the winner's mo-bot is tailored specifically to their own personality and style! Searing, intense psychological questions! Like, you know, "what is your favourite colour? ", "do you like big laser cannons? ", that sort of thing. All proceeds from the auction will go to SSNAP - the Society for the Sick Newborn And their Parents - so if you should wish to buy an absurdly large number of raffle tickets in order to increase your chances of winning, you should very much feel free to do so. 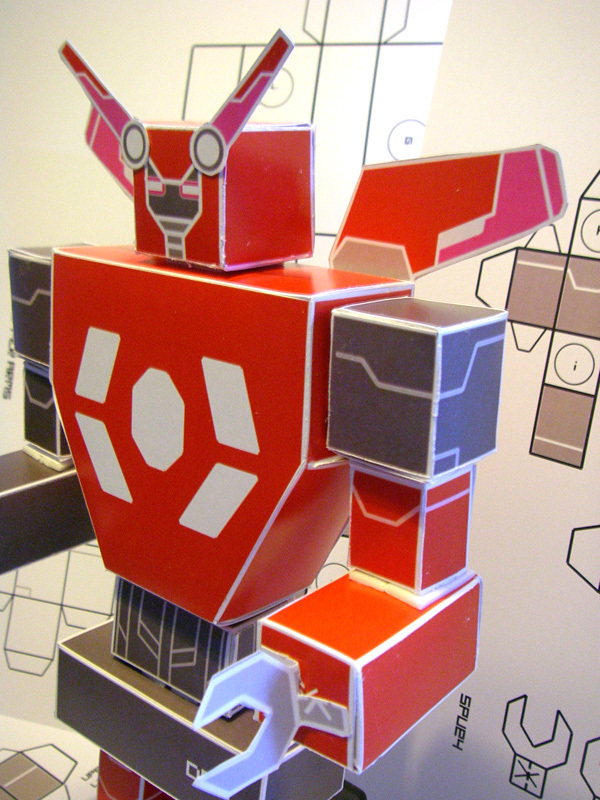 The prize is transferable, so if there is a giant robot afficionado in your life who would like a rather unique Christmas present, we can totally do that. If you'd like to come along to the Giant Mo-Bot Party and be in with a shot of winning this frankly-quite-cool-if-I-do-say-so-myself prize, just contact Blackwells for tickets on 01865 333623 or pop into the Children's Department on Broad Street to request your tickets! Or just let me know you'd like to come via Twitter / Facebook / comments on this very blog, and I'll make sure you're on the list. More details on the Mo-Bot High Events Page! I spent this weekend having a lovely if slightly exhausting time at Leeds' Thought Bubble comics convention. Let me begin by offering huge congratulations to Dave Shelton (pictured above) for winning the inaugural Leeds Graphic Novel Award, at a ceremony held on Friday as part of the comics festival. The award was voted on by the schoolchildren of Leeds, and they voted Dave's Good Dog, Bad Dog to be their favourite graphic novel! (As well they might, it's terrific.) Both of the other first-round DFC Library titles also made the shortlist - Kate Brown's Spider Moon and Ben Haggarty & Adam Brockbank's Mezolith. A fine showing for Team DFC - congratulations all round, chaps! Anyway, it was my first time at Thought Bubble and the day went really well. 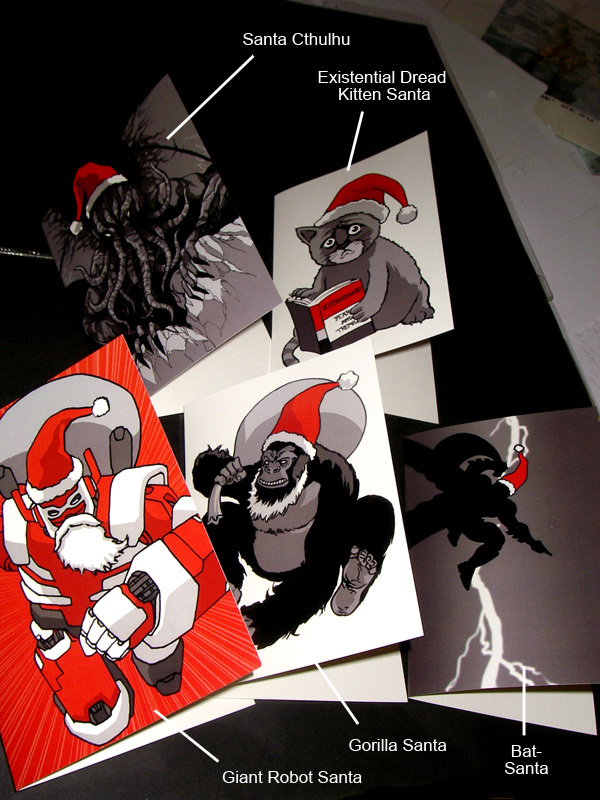 I sold a big old pile of Mo-bot High books, a bunch of posters and prints and stuff, and an absolute ton of my Slightly Strange Santa Cards. They seemed to go so well that I will almost certainly be printing up some more copies and selling them on my shop page, in case you're interested. Check back this week! Unfortunately my table-buddy for the day had to cancel at the last minute, so I was left looking after the table on my lonesome. This meant I really didn't get a chance to actually wander round and see anyone else or buy any comics myself at all. (I'd actually gone up with a shopping list of things I wanted to pick up, too. They were: Simon Perrins' new issue of Hope For The Future, the fantastic-looking anthology Solipsistic Pop #3, and Marc Ellerby's Chloe Noonan: Monster Hunter. Still, never mind, that's what the internet is for, right?) I also pretty much entirely failed to meet a bunch of people I had hoped to say hi to, or indeed spend more than about two minutes talking to pretty much anybody. I did manage to get away from the table long enough to use the gentleman's convenience, and this was just one of the reasons that Dave Shelton is a Legend Whom I Shall Tell Tales Of To My Children and My Children's Children. The other was that he could change a tenner for two fives. I have to say so far Logan isn't very impressed by the fivers story, but he liked the one were Daddy Went Toilet. The tiny amount of people I did manage to talk to were, fortunately, all great - it was fantastic to catch up with the aforementioned Award-Winning Graphic Novellist Dave Shelton, fellow DFC alumni Adam Brockbank and Faz Choudhury, my Best New Manga editor-san Ilya, Rob Davis (currently working on a Don Quixote adaptation for SelfMadeHero that looks rather marvellous), and to meet Simon Gane. (Who seems lovely.) 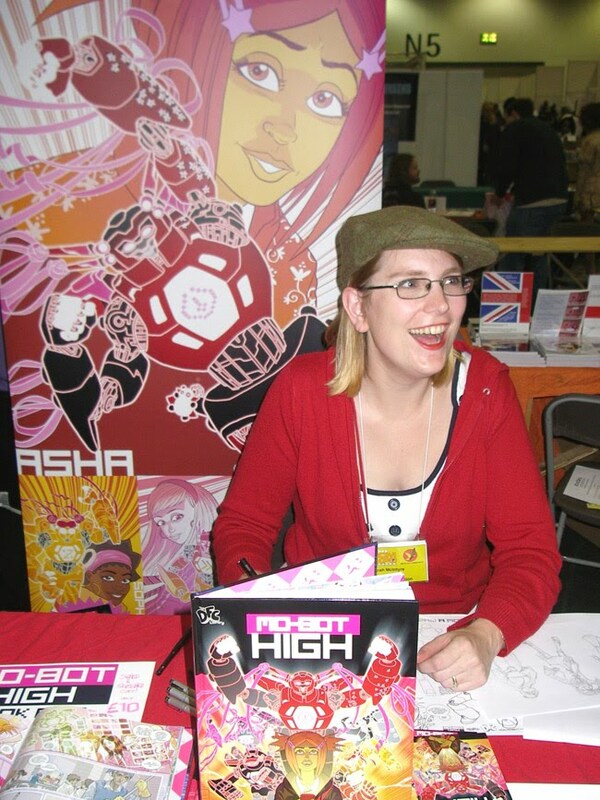 I was really sorry I didn't get to see more of my DFC buddy Sarah McIntyre, who was running all kinds of kid-friendly alien-drawing fun and activities with her You Can't Eat A Princess collaborator Gillian Rogerson. And I only got to talk to Nigel Dobbyn for a couple of minutes but it was a very pleasant couple of minutes, and he showed me a sneak peek at something that put a giant grin on my face and is likely to have an even greater effect on a certain three-year-old of my acquaintance. Will share the details as and when! Around Christmas time, perhaps.. The Thought Bubble after-party seemed like a lot of fun, but due to the aforementioned exhaustion and general advanced state of physical decrepitude I'm afraid I only lasted about ten minutes before heading back to the hotel to have a lie down and a cup of tea and to feel incredibly, incredibly old. Anyway, thanks to everyone who came and bought the book, to everyone who was lovely for being lovely, to Sarah and her tablemates for the Pocky and to Lisa Wood and all the other Thought Bubble organisers for putting together such a swinging comicsy shindig! I shall definitely come again! I'm off up to Leeds tomorrow for the Thought Bubble Comics Festival, where I shall be, y'know, sitting behind a table and selling people comics and sketching stuff and what have you. Good Times! 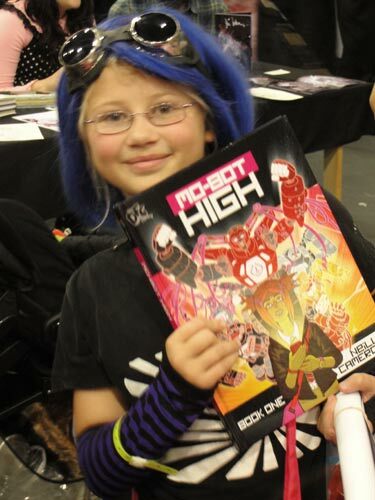 Pop along to grab a copy of Mo-Bot High Book One, complete with a custom robot of your choice sketched in it! Why not buy some and TOTALLY IMPRESS YOUR FRIENDS. *Look, I know it's not even December yet, but - well, the Christmas Sandwiches are in the shops, so as far as I'm concerned it's fair game. Anyway, hopefully see you there! I'm really looking forward to Thought Bubble. I've heard nothing but good things about the festival and convention, and lots of my comics pals are going to be there - including several of my DFC Library colleagues who are all nominated for the inaugural Leeds Graphic Novel Awards, congrats all! - so it promises to be Good Times Indeed! "Let me in, perp! I'm busting here!" 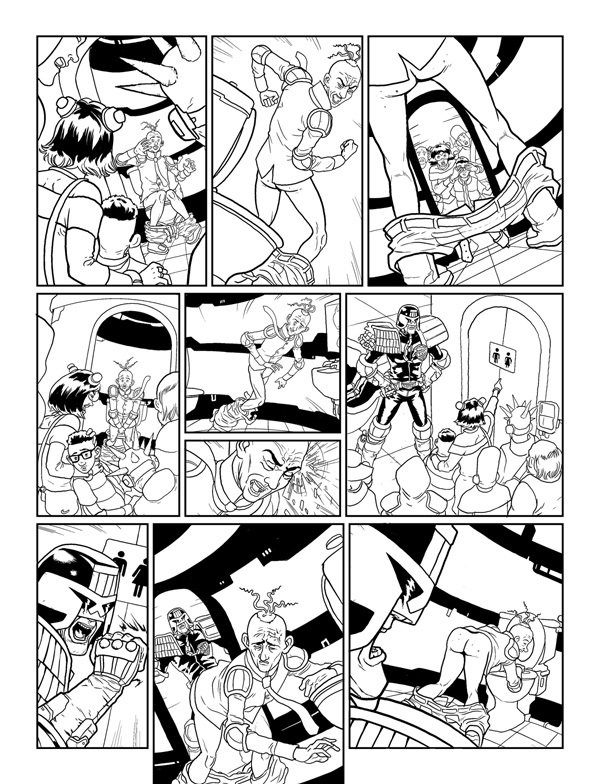 I thought I would try drawing some sample Judge Dredd pages to send to 2000AD! So that is what I did. They're based on the sample script 'PF' from the 2000AD website, which you can go and read for purposes of comparison should you so wish. 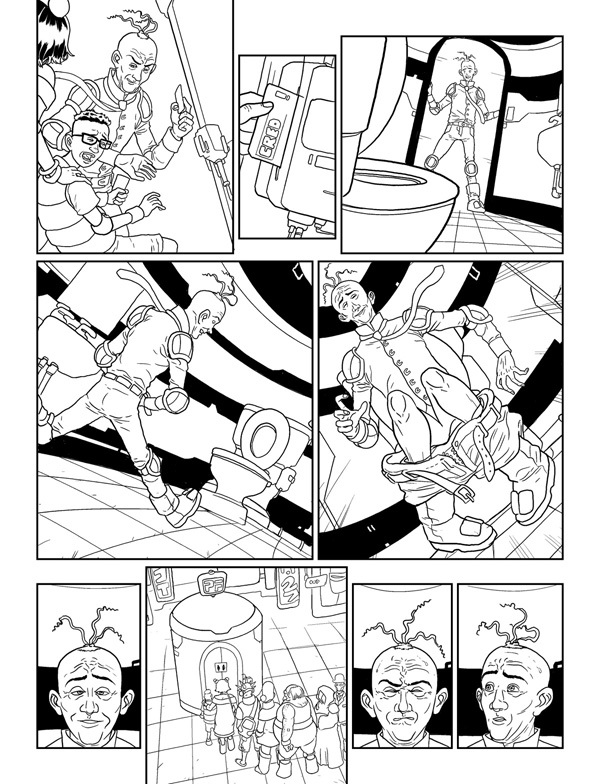 These were quite fun because a lot of the 'action' is, well, it's just a dude sitting on a toilet, so it was a challenge to try and keep the panels dynamic and interesting. 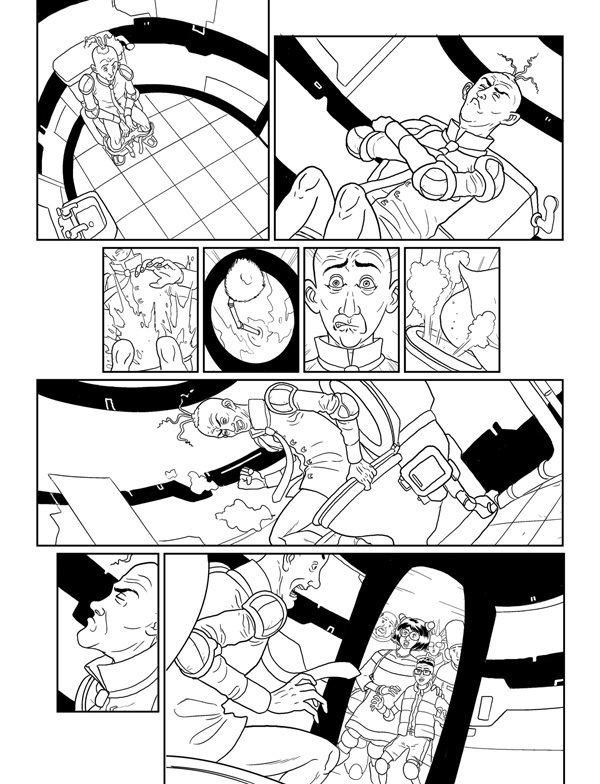 These have been sent off to Mr Tharg for his consideration, I just thought I'd post them up here because - well, why not, really? Wish me luck, faithful The Internet. I read the news today. In the immortal words of Sam Beckett: Oh Boy. 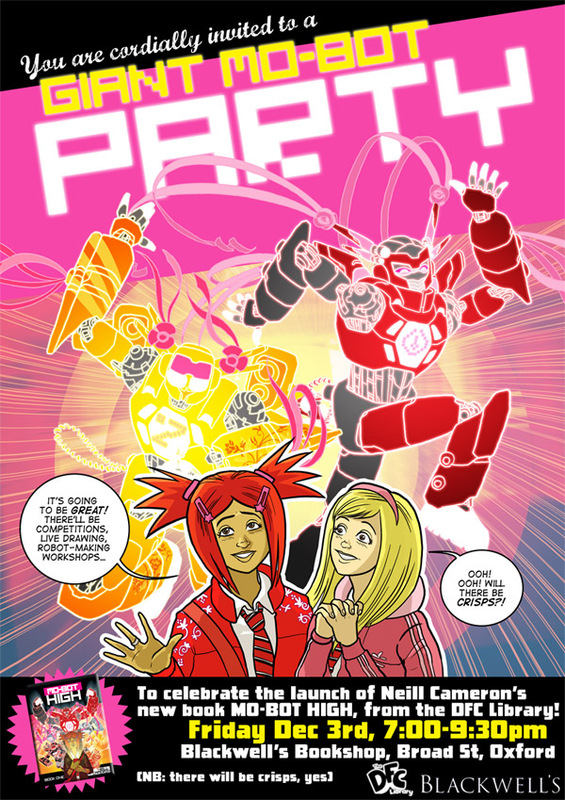 In other news: you can check out a 12-page PREVIEW of Mo-Bot High over on Comics Alliance - easily my favourite comics website IN THE WORLD. And I'm not just saying that because they bigged up my book. 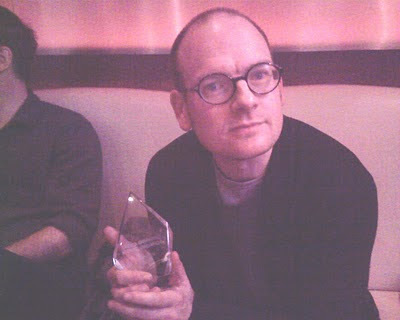 Many thanks to Chris Sims - easily my favourite writer about comics IN THE WORLD - for setting that up. Also: my wonderful fellow DFC Library geezer Dave Shelton said some very nice things about it over on his blog, bless him to bits. Nice things are always nice, but they really mean a lot coming from someone as talented as Dave. Comics creator Neill Cameron, seen here totally failing to get to grips with one of these new-fangled interactive whiteboards. This Wednesday I was off doing exciting book promotional type things down in the west country! First of all, I was made enormously welcome by the lovely staff of Widecombe-in-the-Moor Primary school, where I was visiting to teach a bunch of children all about the fun of drawing comics and that sort of thing. I guess I hadn't realised that Widecombe-in-the-Moor was, quite literally, slap bang in the middle of the moor. Dartmoor, to be specific. In retrospect, the clue was right there in the name. Anyway, it was a lovely school in an absolutely gorgeous spot, and much fun was had there. "So basically, kids take any story idea you have and put more robots in it." I took along the latest version of my patent-pending Awesome Idea Generator (or Awesomeatotron, if you will) and we all had a lot of fun making comics about Gorilla Vampires, Killer Giant Marshmallows, Tiger Ballerinas and suchlike. Getting to do these workshops and see the sheer imagination and funniness of the kids taking part really is turning out to be one of the unplanned highpoints of my job. How to draw a Shark. And a Robot. PRO TIP: it's pretty much just boxes. It was then a short hop back across Dartmoor to Exeter, where I was doing a talk at Exeter Central Library. I was a bit nervous about this, as it was the first time I've done this kind of event on my own, and I was slightly unsure about (a) whether anyone would actually turn up, and (b) what on earth I was going to do if they did. Anyway, I am happy to report that (a) they did, and (b) I kind of figured it out as I went along, and it was AWESOME. I mean, really. I'm uncomfortable with praising myself, but even I have to concede that it kind of turns out I'm genuinely good at this kind of thing. It was so much fun - kind of a mix of a talk, art lesson, stand-up comedy and interactive live drawing jam thing. Anyway, I really enjoyed it! I think the audience did, too. Together we put together an on-the-spot comics EPIC about the adventures of Secret Agent Soul Reaper, his nemesis Marissa Montezuma: Aztec Journalist and her hordes of Mindless Zombie Chavs. Like I say, it was a lot of fun. And frankly, I think Marissa Montezuma: Aztec Journalist is the character find of 2010. 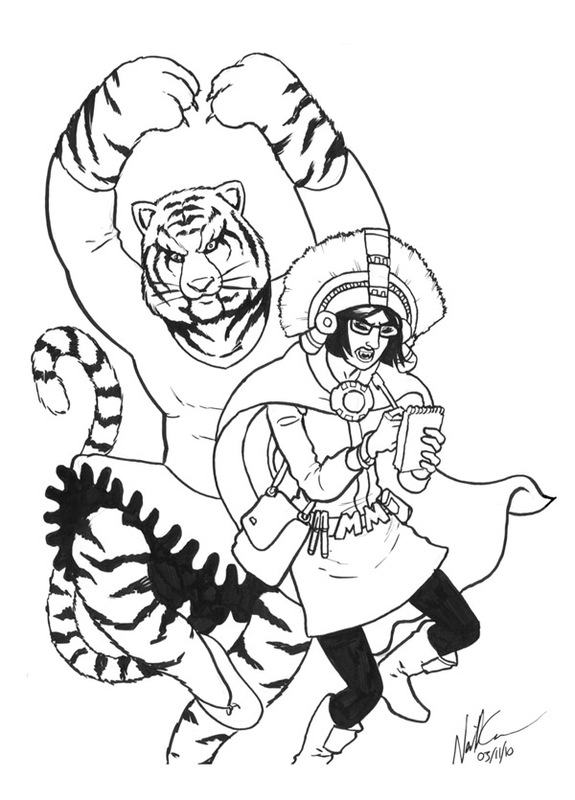 Here is a sketch I did on the train home of her, with a tiger ballerina. It really is kind of weird - I've always thought of myself as totally shy and awkward, and only good for sitting in a room on my own and drawing stuff, but it turns out you put me on a stage with a pen in my hand and my inner attention-seeking megalomaniac just jumps right out. Fun times! I'm really looking forward now to doing more of these school and library events - I've got a few bookings coming up in January and December and now I'm raring to get to them! Keep an eye on my website's Events page for more details as they're confirmed! Huge thanks to Lis Spencer at the EXEtreme Imagination festival for inviting me along, to Kate Edwards and everybody else at the school and library for making me so welcome, and to all the pupils and audience members who came along for being so awesomely entertaining! That's right, we are having GIANT MO-BOT PARTY! Or "book launch" as it is rather more prosaically known. There'll be lots of mobot-ty art on display, nibbles and drinks and chat with lovely comicsy people, some awesome cardboard Mobot-building shenanigans to join in with, and a raffle with a pretty exciting prize, which I shall blog more about later! The event is open to all, but Blackwells will need to know how many are coming, so if you'd like to come along just drop me a line to neill (at) neillcameron.com and I can make sure you're on the guest list. EDIT: Oxford residents can just pop into Blackwells children's department and ask for tickets there. Simple! Do come along. Fun times! 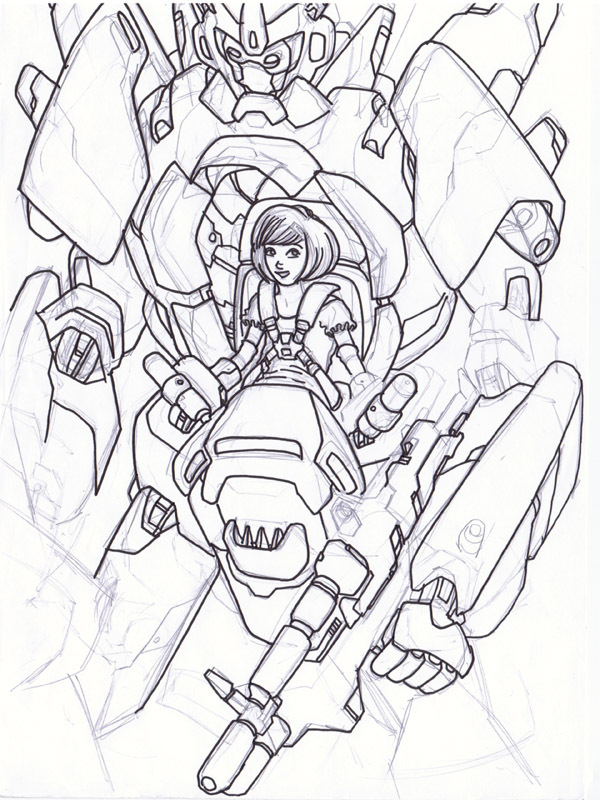 Unfinished sketch of.. oh guess what, it's a girl with a mecha combatsuit. Here are some doodles from this weekend's MCM Expo! 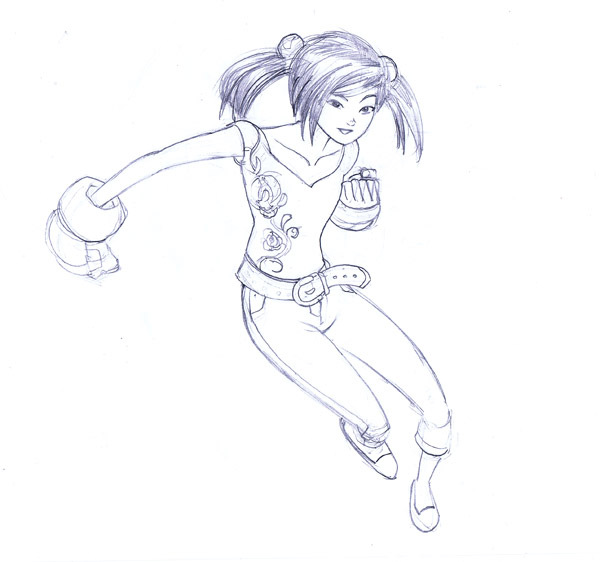 Yes, there were occasional moments when it was slow enough to doodle. Here are some people who stopped by our table and stood still long enough to be sketched! From left to right: a girl cosplaying as Starscream (awesome), the always-lovely Karen Rubins (not cosplaying, just naturally stylish), and someone else who seemed very nice but whose name I failed to catch. I don't care what it says, that looks like the handiwork of noted cartoonist and identity thief Sarah McIntyre to me. 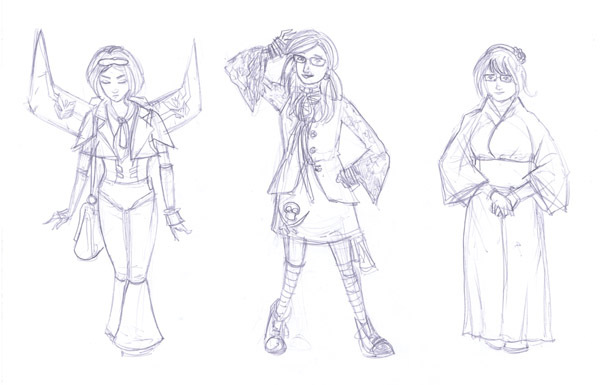 Check out some more of Sarah's amazing sketches from the event over on her blog! 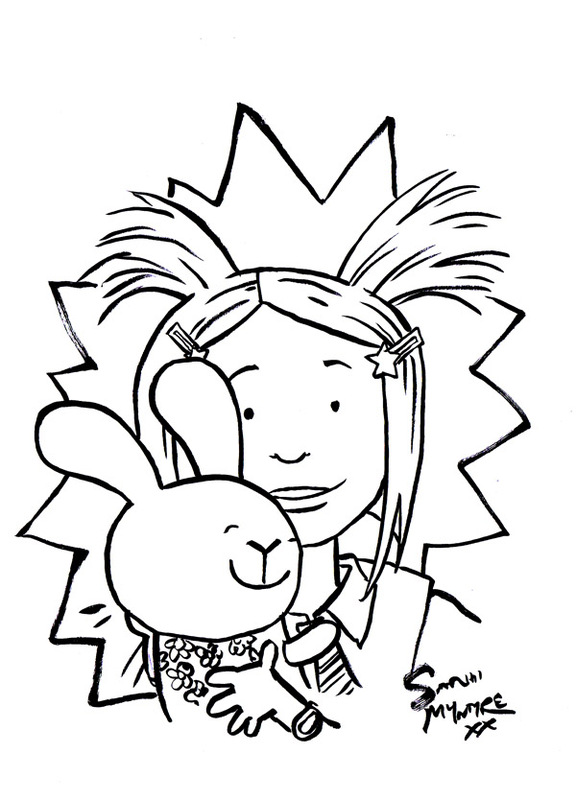 Sarah also drew the following lovely sketch of DFC Library pals Asha from Mo-Bot High and Lettuce from, duh, Vern & Lettuce. I'm off down to Exeter tomorrow to do a couple of talks and workshops as part of the EXEtreme Imagination children's literature festival. One is a public talk, 5pm at Exeter Centreal Library - if you're interested, you can find out more and get tickets here! Do come along, Exeterians! It will be lots of fun. "In Mo-Bot High Neill Cameron has delivered a modern comic book that has strong appeal to both boys and girls and he should be commended for this - I hope we see much more from this series in the future, but that will only happen if fans of this method of storytelling go out and buy copies of the various DFC Library releases." He's absolutely right, you know. So please, go buy them! Comics creator Neill Cameron, seen here looking uncharacteristically cheerful. Hey wait, that's not me! That is Sarah McIntyre stealing my identity - or "cosplaying" as she would have you believe - at London's MCM Expo this weekend just gone. I had a fabulous time, and managed to TOTALLY SELL OUT of Mo-Bot High! Again! Lots of books sold to lots of lovely people, many of whom were dressed as ninjas and / or zombies. Look, here are some satisfied customers! 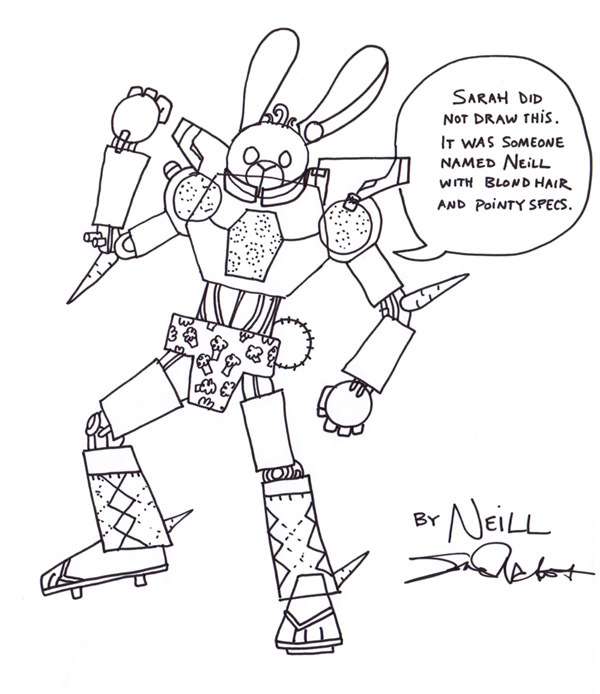 I was drawing personalised custom mo-bots in each book I sold, as a fun thing. 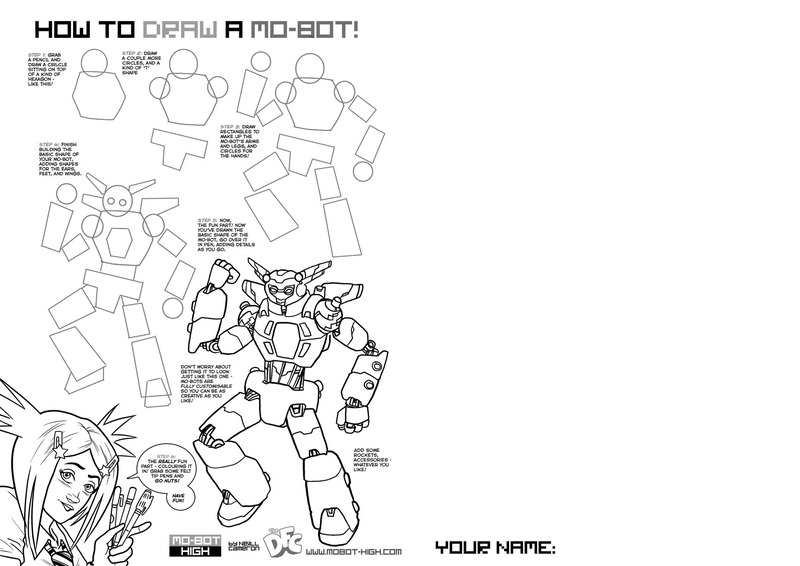 Off the top of my head I remember drawing: a ninja-bot, a spider-man-bot, a zombie-bot, SEVERAL pirate-bots, a steampunk-bot, a chimp-bot, a monkey-bot, a panda-bot, a big buzzing bee-bot, a giant-jar-of-peanut-butter-bot, a skinny-jeans-wearing-hipster-bot, a cheese-bot, a cosplayer-bot, two bunny-bots, a cross-dressing-bot, and a one-of-those-blue-dudes-with-the-spears-from-Avatar-bot. Wow, that list sounds like the text for a children's book I would totally read to Logan. 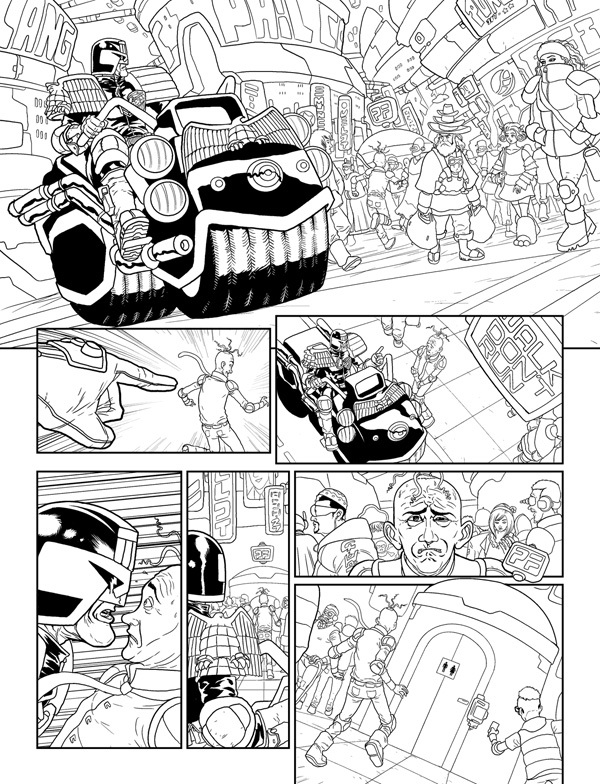 I fully intend to continue this schtick at future events, because it was a lot of fun and gave me all sorts of things to draw that I have never drawn before, which is always nice, so if you're coming to Thought Bubble in two weeks get thinking now about what kind of giant robot you might want! It was really nice to spend the weekend hanging out with my DFC Library compadres, with Sarah on one side with Vern & Lettuce, and the marvelous Bob & Lorenzo Etherington on the other with Monkey Nuts. We even did a stage show, where we all wittered on a bit about comics being awesome and stuff and then delved into the main business of the day - a rematch bout of the live drawing battle extravaganza that is SHEEP VS ROBOT!!! The whole thing was a lot of fun, with Bob MC-ing up a storm and bounding around with his mic taking suggestions for Sheep and Robot weapons and accessories from the crowd like an awesome indy comics version of Jerry Springer. There weren't many people in the audience when we started, so I was just happily drawing away and when I looked up the whole place was packed. People are drawn to Sheep fighting Robots! Based on the Cheer-o-Meter Combat System (tm, patent pending) I think it's safe to say Vern totally trounced my angel-winged monkey-tailed long-haired mo-bot in the resulting battle. That makes it a thrilling 1-1 draw in this season's SHEEP VS ROBOT league table so far! Surely some kind of a tiebreaker is required to settle this brutal vendetta once and for all. Just across the way from my table was the marvelous Garen Ewing, and just next to Sarah was her Fleece Station studiomate Gary Northfield, both of them wonderful comics creators and thoroughly marvelous guys to spend time with, so it was a really nice weekend - felt like our little corner of the comics village. 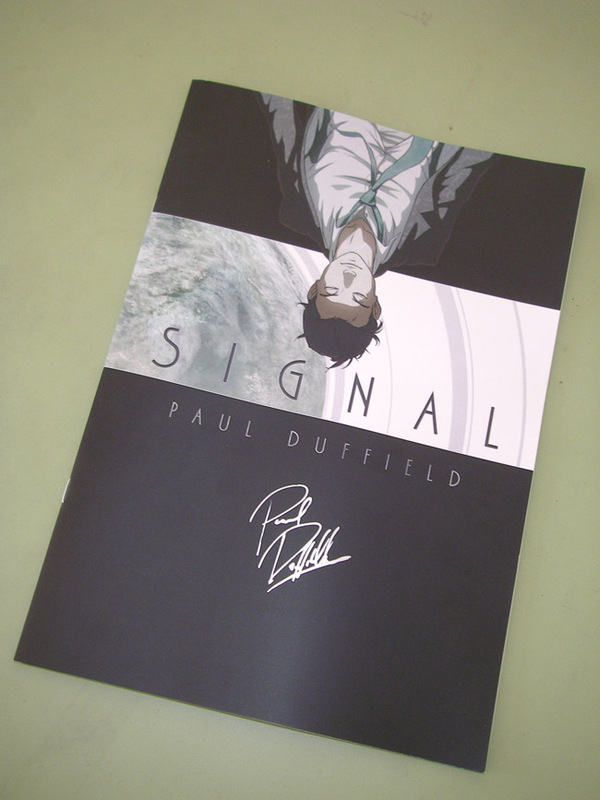 A signed, freshly-minted copy of the simply gorgeous Signal by Eagle-Award-Winning Comics Artist Paul Duffield! Who is lovely. 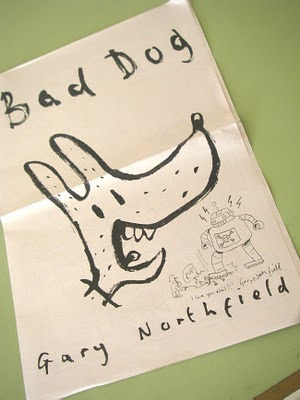 The fantastic new newspaper-format comic collection Bad Dog by the aforementioned (lovely) Gary Northfield. 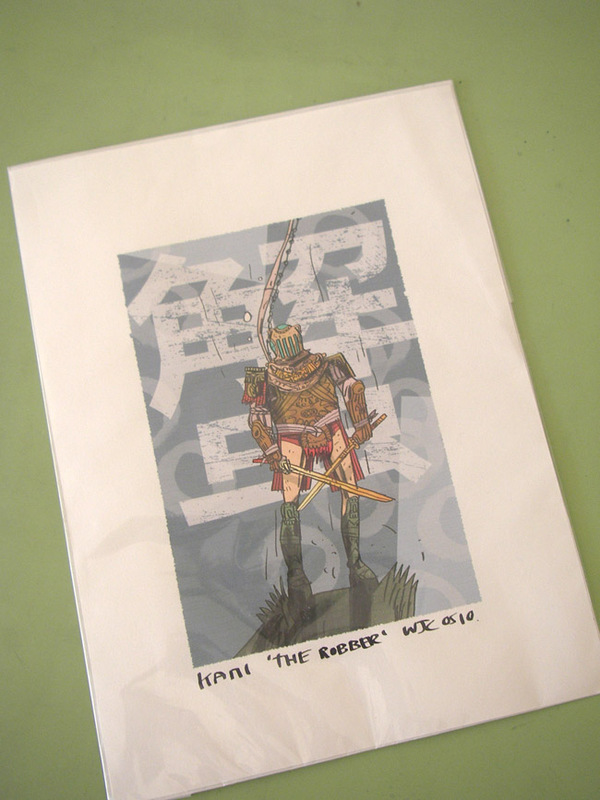 A gorgeous Kani print by Warwick Johnson Cadwell, an artist whose work I'm rapidly falling hopelessly in love with after picking up his Kani minicomic at BICS. And who, again, is lovely. 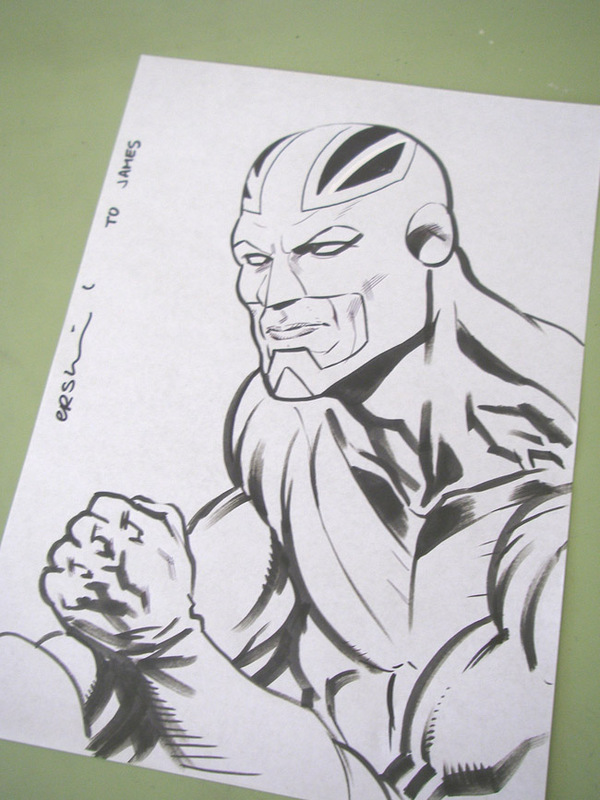 An original sketch of Captain Britain (yay!) 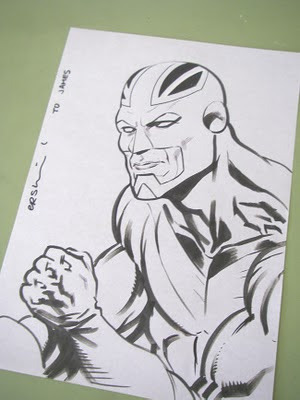 by Gary Erskine, an artist I've been a huge fan of since I was about 13 and who was kind enough to draw this for my brother James after hearing what big fans we both were of his fantastic Marvel UK series Knights of Pendragon in our youth. And who, it turns out, you'll never guess what, is totally lovely. I realise how monstrously I overuse the word 'lovely' when talking about comics creators, but I can't help it. A funnier, smarter, kinder, more passionate and generally delightful group of people you couldn't hope to meet. I mean, the ones I know, anyway. I don't know about the rest of 'em. You hear some funny stories. Thanks to everyone who bought a book, everyone who was lovely, and especially to Emma Vieceli and her fellow Expo organisers for making it such an enjoyable, successful and smoothly-run event. And while I'm at it, to the Expo helper volunteers like the marvelous Rory, who pitched in and looked after my table while I had to go draw fighting monkey robots and stuff. Thanks, Rory!